Liberalisation in 2010 - One of the key aspects of this liberalisation, which will probably take effect in summer 2010, will be the opening of the interactive/online sports and horse race betting markets as well as of the online poker market. Nearly all market players look to France - According to MECN’s new research, ca. 80% of the gambling operators and experts surveyed consider the French market relevant or even very relevant to their future business. 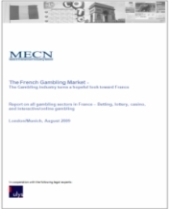 Online poker of top interest - 77% of the operators surveyed in MECN’s study are seeking to obtain a French online poker license. Current size of market is immense - The licensed gambling market (incl. casinos) in France totalled ca. Euro 70 billion in 2008 (turnover/sales). In terms of gross revenue, the market achieved Euro 8.5 billion in 2008. Large growth potential - While the horse race betting market has a long tradition in France, sports betting and poker are not yet as developed and thus offer great potential for future growth. Analyses of all sectors - The report analyses all sectors of the gambling market: interactive/online gambling, betting (sports and horse races), lottery, and casinos. Forecasts until 2015 - Detailed forecasts for all sectors with a special focus on the interactive/online market up to the year 2015. Liberalisation process and updates - Up-to-date information about the ongoing liberalisation process incl. the most recent adaptation and changes to the draft bill (e.g., tax on poker, …). Legal and tax information - Detailed explanation of the current legislation and the taxes imposed - produced in cooperation with leading legal experts of Ulys. Unique insights through survey of market insiders - Many analyses are based on the results and the unique insights we gathered from our survey of more than 50 market insiders and operators. Translation of entire liberalisation draft - Complete English translation of the entire online gambling/betting liberalisation draft (parliamentary bill - N° 1549 of March 2009). In total, the report has nearly 130 pages and 66 graphs/exhibits.